283 Beacon is located on the south side of Beacon, between Dartmouth and Exeter, with 281 Beacon to the east and 285 Beacon to the west. 283 Beacon was designed by Cabot and Chandler, architects, and built in 1885-1886 by McNeil Brothers, carpenters, and Charles A. Dodge, mason, one of two contiguous houses (283-285 Beacon) designed as a symmetrical pair. 283 Beacon was built as the home of Emma (Emeline) Bicknell (Franklin) Bush, the widow of cotton mill treasurer Samuel Leonard Bush. 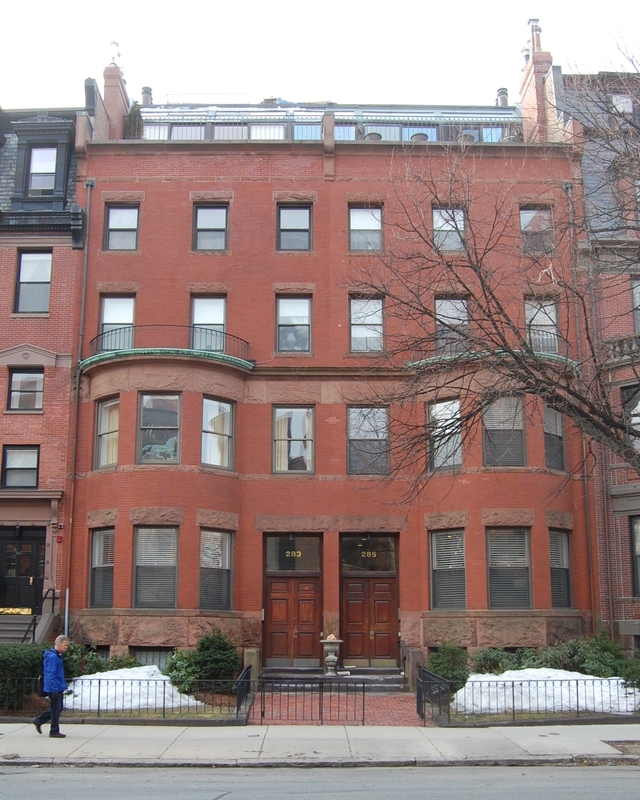 They previously had lived at 140 Marlborough, where Samuel Leonard Bush had died in April of 1884. They also maintained a home in Hamilton. 283 Beacon was built on a 24 foot wide lot which the Commonwealth of Massachusetts conveyed to Emma Bush on April 7, 1885. The land originally was sold by the Commonwealth at its auction on November 26, 1866, and by 1881 the right to purchase it was held by dry goods merchant John Francis Anderson, who also held the right to purchase the lot at 285 Beacon. On April 13, 1881, he entered into a party wall agreement with Charles W. Freeland, owner of the lot at 281 Beacon. John Anderson subsequently opted not to purchase the land at 283 Beacon and it was acquired by Emma Bush. Click here for an index to the deeds for 283 Beacon. Emma Bush lived at 283 Beacon with her unmarried children: cotton broker Samuel Dacre Bush, Emma T. Bush, and Mary L. Bush — and her unmarried brother, Daniel B. Franklin. Samuel D. Bush is shown as the owner on the original building permit application for 283 Beacon, dated April 23, 1885, and on the final building inspection report, dated July 15, 1886. Bound with the building inspection report, located in the Boston Public Library’s Arts Department, is a floor plan for the second floor. Daniel B. Franklin, continued to live at 283 Beacon until about 1893, when he moved to Bristol, Rhode Island. Emma Bush died in April of 1904. In her will, she specified that 283 Beacon was to remain for the use of her three unmarried children, but when two of the three either married or died, the property was to be sold and the proceeds distributed to all of her children or their descendants. Samuel Dacre Bush married in February of 1905 to Mary Duryee Nichols. After their marriage, they made Hamilton their primary residence. Emma and Mary Bush continued to live at 283 Beacon, joined by their niece, Miss Margaret S. Bush (daughter of their brother, Rev. Franklin Bush). Emma and Mary Bush’s nephew (and Margaret Bush’s brother), Samuel Dacre Bush, II, also lived with them from soon after his graduation from Harvard in 1909. He was a cotton broker in his uncle’s firm, S. D. Bush & Co. He married in October of 1916 to Mary W. Williams; after their marriage, they lived in Needham. Emma, Mary, and Margaret Bush continued to live there until about 1935. They also maintained a home in Ogonquit, Maine. Emma Bush died in about 1935, and by the 1935-1936 winter season. Mary and Margaret Bush had moved to the Hotel Lincolnshire at 20 Charles. 283 Beacon was not listed in the 1936 Blue Book. On June 5, 1936, 283 Beacon was purchased from the estate of Emma B. Bush by Abraham Zwi Wintman. He lived in Mattapan with his parents, Isadore (Jacob) Wintman and his wife, Gertrude (Gitel) (Wintman) Wintman. In March of 1936, Isadore Wintman applied for (and subsequently received) permission to convert the property from a single-family dwelling into eight apartments. In June of 1936, he amended the plans, increasing the number of units to ten. On December 23, 1940, Israel M. Levin foreclosed on a mortgage to Abraham Wintman and sold 283 Beacon to James F. O’Brien, Jr. On March 12, 1941, it was acquired from James F. O’Brien, Jr., by Julius Katzeff, and on July 17, 1941, Abraham Wintman acquired the property back from him. On August 3, 1979, 283 Beacon was purchased from Abraham Wintman by 285 Beacon Associates, Inc. (Robert Epstein, president). In January of that year, it had purchased 285 Beacon. 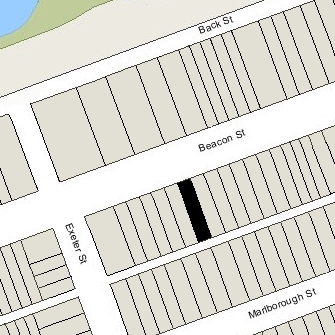 In August of 1979, David and Robert Epstein filed for (and subsequently received) permission to combine 283 and 285 Beacon into one property, add two stories to the combined property, and convert it into fourteen units. The prior use of 283 Beacon was as ten apartments, and the prior use of 285 Beacon was as a lodging house. 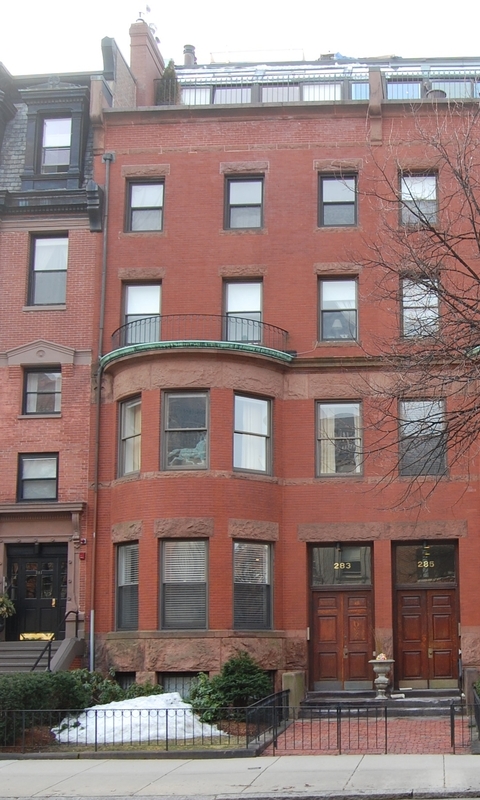 On June 16, 1980, they converted the combined property into fourteen condominium units, the 285 Beacon Street Condominium. In October of 1997, the 283-285 Beacon Condominium Trust applied for (and subsequently received) permission to combine Units 1-A and 1-B into one unit, and reduce the number of units from fourteen to thirteen.